This was realistically our best chance at winning a match for the rest of this season. Even if statistically based on Udinese’s recent form, it was most likely going to be a draw. But Di Natale made his intentions clear in the first minute that they were after all three points, and he set the tone for the entire match. Milan seemed like they believed they were outmatched. And I know that playing away can do that to a team, especially with such passionate fans as there were in Udine, but this one wasn’t pretty. All hopes that I had for this match being decent or pulling a result were dashed when I saw the kits. Udinese’s sponsor had summoned up some bizarre hybrid jersey based on a handball team they also sponsored, and Udinese looked like their laundry had been inexplicably mixed up with Genoa’s or something. But I couldn’t even laugh at that because Milan were wearing those yellow kits. Again. And that level of fail in design could only be matched by a performance that was not quite as terrible on the pitch. But the performance wasn’t what we’d hoped for, either. Udinese pinned us back, fouled us, and then cried wolf better than any actor who won an Academy Award this year could have. Luckily, Damato did a good job keeping the match as clean as possible but allowing them to play as well. And now I have run out of positive things to say. Pinzi’s goal in the 58th was scored from a set piece, he was unmarked at the top of the box and shot through at least three players. 1-0 Udinese. 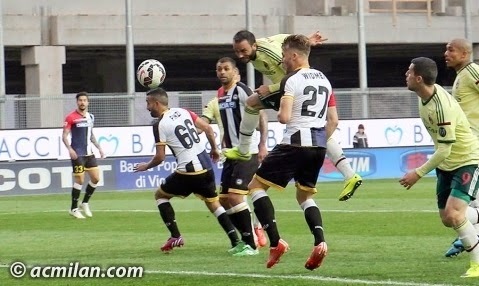 In the 74th, Badu’s goal was from the run of play, the rebound from a Di Natale shot that Lopez parried away. 2-0 Udinese. On a play that started from a Milan corner in the 87th, apparently the first one we’d earned all day, Cerci put in a nice cross for Pazzini, who headed it in to give Milan a consolation goal, 2-1 Udinese. Beyond that, there isn’t much else to say. The players were likely defeated when they saw those yellow kits in the dressing room. Or maybe they were confused by Udinese’s, knowing they are facing Genoa on Wednesday. They obviously believed Udinese could beat them, and believing is the most important thing. Showing up is also important, and I struggle to maintain respect for fans who fail to show up but still have so much to say about what they didn’t watch. Especially for those who are just waiting for a miracle. This was another poor performance from a team that has fallen from grace, but I watched every painful minute of it. I wish it was better, I wish a lot of things. But at the end of the day, we all said this season was a write off last summer, and it’s not fair for any of us to expect anything more. Watching Milan this season was never going to be a walk in the park. And this game especially was not for the faint of heart.